You can have a smile that leaves people star-struck with a little help from aligners, teeth whitening and more. Your family’s health is in good hands. We can care for your kids, you and your elderly parents without missing a beat. Dentures and overdentures can dramatically alter a person’s mouth for the better. If some or all of your natural teeth aren’t viable, dentures can make a huge difference. It may make you wince to think about, but if you need a tooth extracted, EVDP is the right place. Your comfort is always at the top of our minds. No matter how healthy your teeth are, stains from coffee or wine can put a damper on your dazzling smile. With our whitening procedure, you’ll see huge results--soon. Dr. Collins wanted to be a dentist beginning when she was eight years old, and it shows. She will immediately put you at ease with her warm, friendly manner. She’s an excellent dentist and a kind, empathetic person. Your dental needs come first with us. Whatever it takes to create your best smile--and ensure you have excellent oral health--we’re here to make it happen. Regular cleanings and exams are the foundation of a lifetime of healthy, beautiful teeth. Your entire family--from little ones to grandparents--is welcome at East Valley Dental Professionals. A child’s first dentist appointment, Invisalign and dentures are all within our expertise. You’ll feel like your loved ones are well taken care of with our pediatric and geriatric dental services. In addition to giving you a great grin, we can perk up your whole face with Botox and/or dermal fillers. These minimally invasive (really!) additions can take years off of your appearance in just a few minutes. 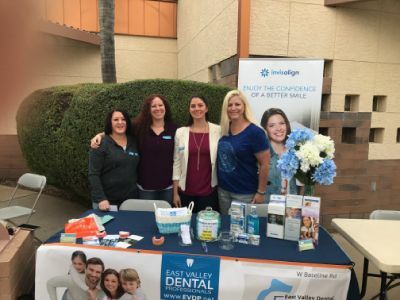 You’re probably looking for a Mesa dentist with staying power and ties to the area; you’re looking for compassionate care from people who know you and your family. Since the 1980s, our family practice has been caring for people in Mesa and the surrounding communities. Our philosophy has always focused on building relationships with our dental patients. We care about you and are always happy to see you and your family walk in the door. If you’re having a dental emergency and need a Mesa dentist, call us and we’ll get you in as soon as possible. I've been a patient for fifteen years and I couldn't imagine going elsewhere. Everyone is professional, kind and the best of the best! I've had most every oral procedure and each has been flawless. Dr. Collins has small hands and a big brain! Size matters in dentistry! Everyone was helpful and kind. I appreciate the introductions of who people were. My stay was pleasant and I'm hopeful my tooth problem is resolved.